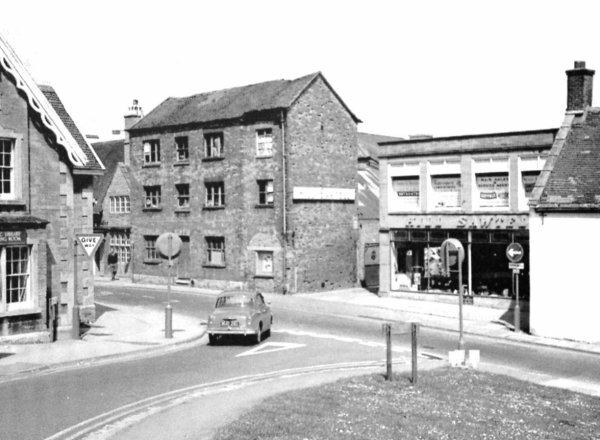 John Petter moved his family to Yeovil around 1865 when he purchased the ironmongery business of Hannam & Gillett in the Borough (today's 15 High Street). His new ironmongery business was advertised in the Post Office Directory of 1866. In 1870 John gave the ironmongery business to his son, James Bazeley Petter, as a wedding present on the latter's marriage. During the 1890s two young lads, Harry Hill and John Sawtell, both worked for James Petter as assistants in the ironmongery side of Petter's business. In 1901, as a financial crisis loomed in the many Petter business concerns, the twin sons of James Petter, Ernest and Percy, bought the various businesses from their father following which they reorganised and renamed it as James B Petter & Sons (Ltd) with both the sons as joint managing directors. Also a director for over thirty years was John Vincent. Their father James retired from business and moved briefly to live in Bristol although he shortly returned to Yeovil to live in his house 'The Grange' in The Park but died just five years later. 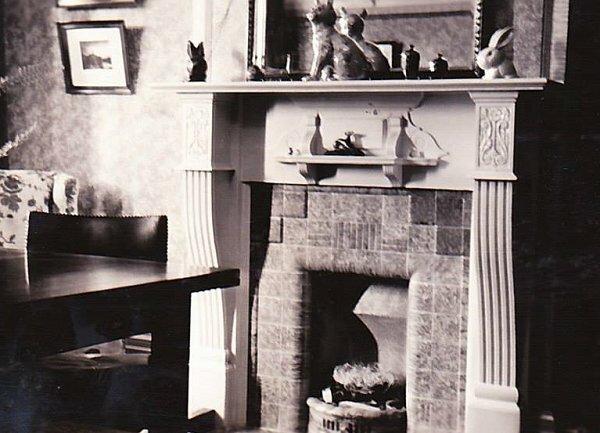 While Percy and Ernest reorganised the company their brothers Harry and Hugh, trading under the name of 'HB & H Petter', managed the original business including the Foundry & Engineering Works in Clarence Street and, particularly, the ironmongery and hot water heating side of the company in the Borough. But, as Percy recalled later "It was however for some reason not very prosperous, and Hugh left to commence business and carry on missionary work in Buenos Aires, and later Harry left with his family to take up farming in Australia." That business was then formed into a company under the name of Hill, Sawtell & Co, in which the Petter family held the principal interest. 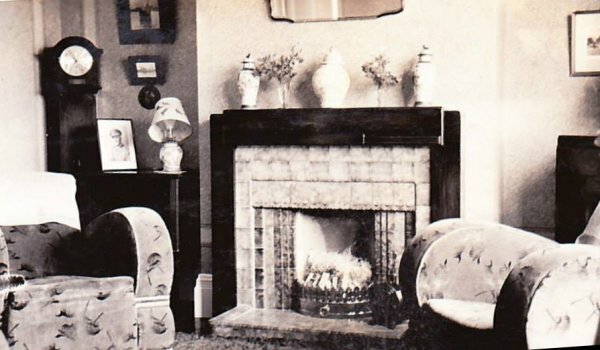 Harry Hill and John Sawtell, as mentioned above, had both been associated with the business for some years and Percy Petter remained a director of the company until his death in 1955. Harry Hill died in 1947 and John Sawtell died on 23 October 1965. 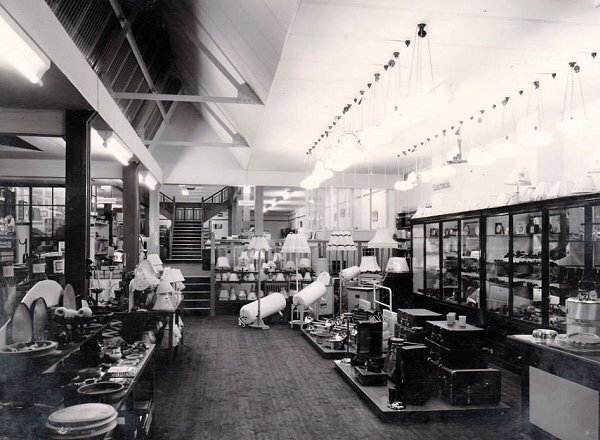 Harry's son James "Jimmy" Hill and John's son Havard Sawtell took over the business, which later 'down-sized' and traded from a smaller shop in Princes Street. 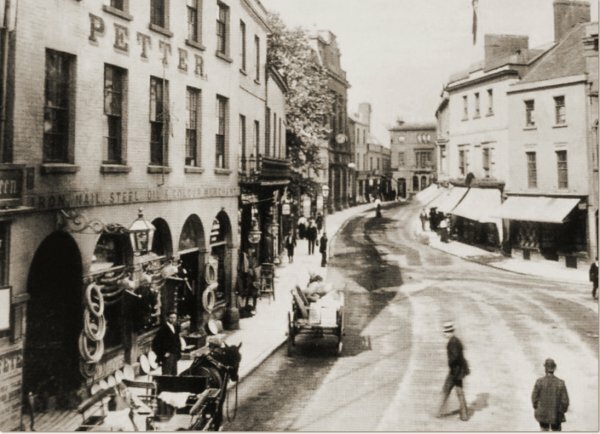 A view of High Street from the Borough probably taken in the 1890's with James Petter's shop at left. William Edwards had been in business in the building at least as early as early as 1790 when he was listed as an ironmonger and cutler in the Universal British Directory. In 1827 Josiah Hannam took over the premises, later the partnership of Hannam & Gillett. The business was bought by John Petter in 1865. 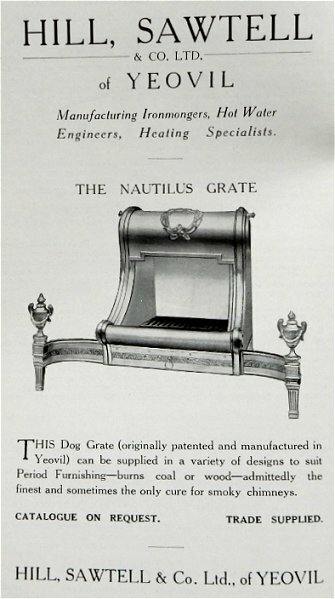 An early Hill, Sawtell & Co Ltd's advertisement in a Yeovil Guide of the late 1920s featuring, somewhat unsurprisingly, the firm's owners' (ie Petters) dog grate. This photograph of Harry Hill and John Sawtell's ironmongery business in the Borough, formerly the shop of James B Petter, was taken most likely in the 1930s. 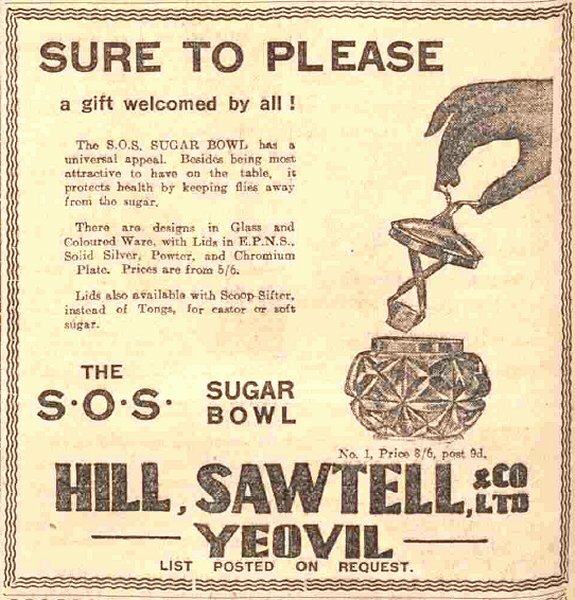 An advertisement placed in the Western Gazette's edition of 14 December 1934. 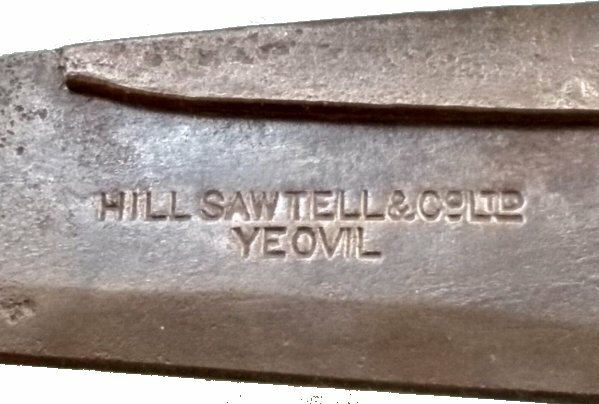 Hill Sawtell advertised themselves as "shear makers to the glove industry" and this is an example; a No 3 shears, measuring 15½" (390mm) long by 4½" (110mm) wide. A close-up of the Hill Sawtell logo on the above shears. A tea spoon, 5" (128mm) long, marked and sold by Hill, Sawtell. Detail of the above tea spoon. 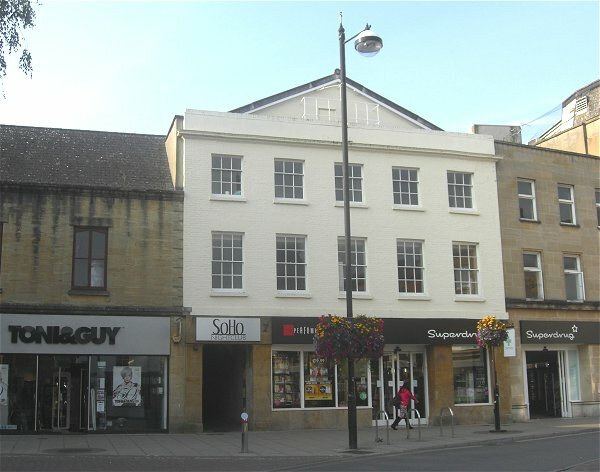 The oldest surviving building in the Borough, appearing in the first image above. 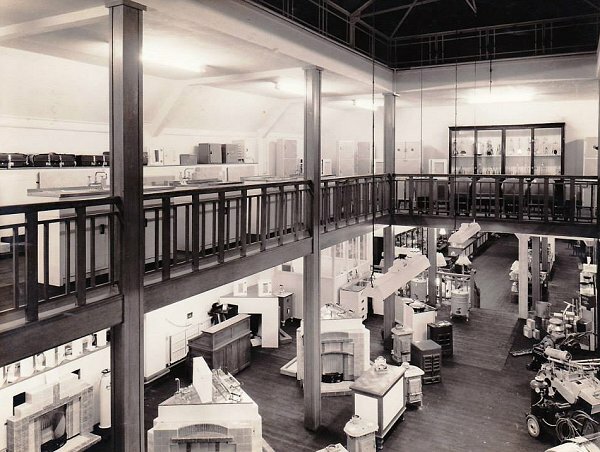 It was built originally as the ironmongery shop of William Edwards (in 1790), then Josiah Hannam, followed by James Bazeley Petter and then Hill, Sawtell & Co - in fact it was in continuous use as an ironmongery from 1790 until the 1970s, which must be some kind of record. Today it is Superdrug. Photographed in 2013. 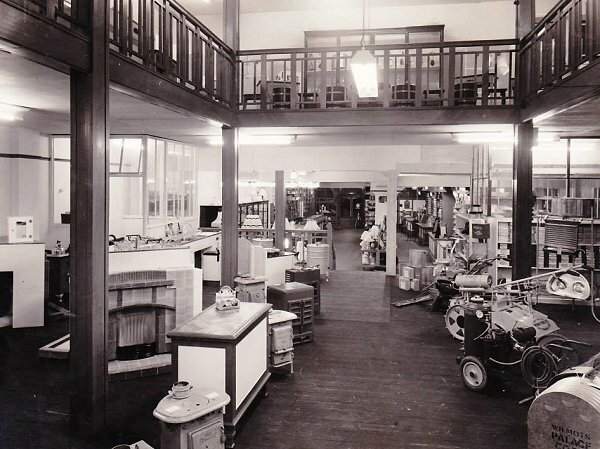 The following photographs showing the interior of Hill, Sawtell & Co's shop were taken by Harold Tilzey and are from an album dated July 1940. All are shown here courtesy of Michael Wilcox. Interior shot of the lighting department. Also featured are luggage and kitchen goods. This is a general view of the shop's ground floor with a display of fireplaces and free-standing fires at left and a small selection of agricultural machinery at right. Looking back through agricultural machinery and a milk churn at left, and fires and fireplaces at right, to the stairs that gave access to the upper gallery. 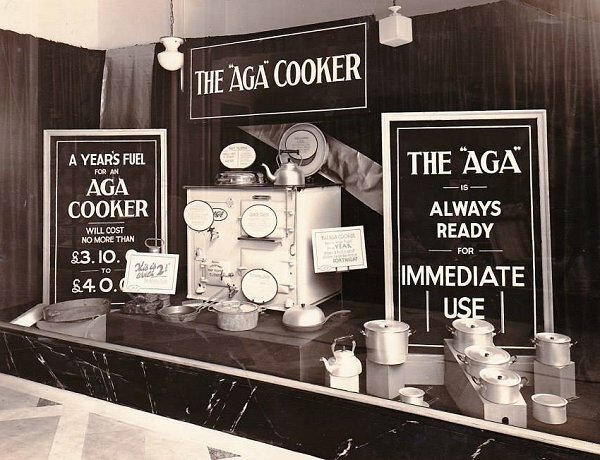 An AGA cooker display. The Aga cooker was invented in 1922 by the Nobel Prize-winning Swedish physicist Gustaf Dalén (AGA is an abbreviation of the company name, Aktiebolaget Gas Accumulator). 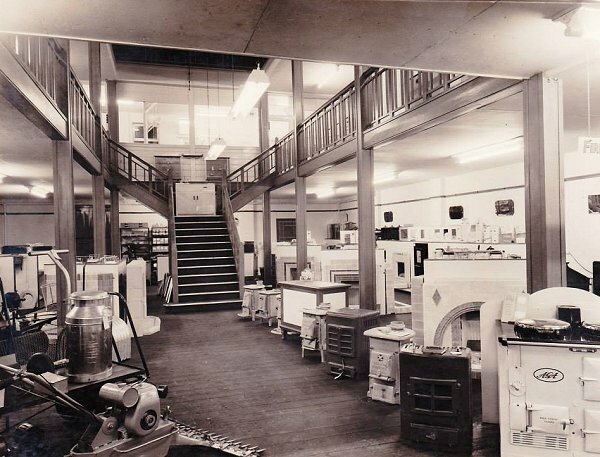 The cookers were first imported to Britain in 1929, and were first manufactured here under licence in the early 1930s. A view of the upper gallery, holding a range of kitchen units, cupboards, glassware, etc. A photograph of a Hill, Sawtell & Co fireplace installed in a customer's house. Another Hill, Sawtell & Co fireplace installed in a customer's house. 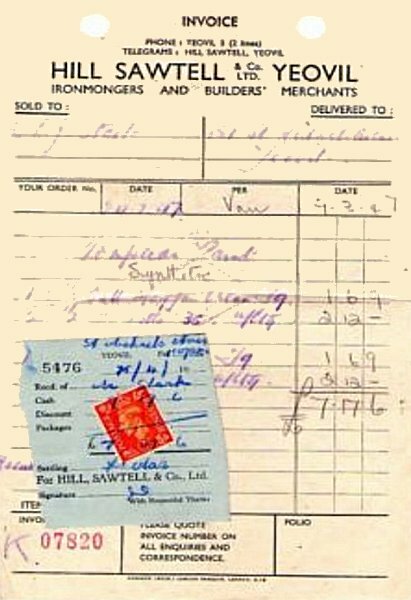 A Hill, Sawtell & Co invoice dated 9 March 1947. 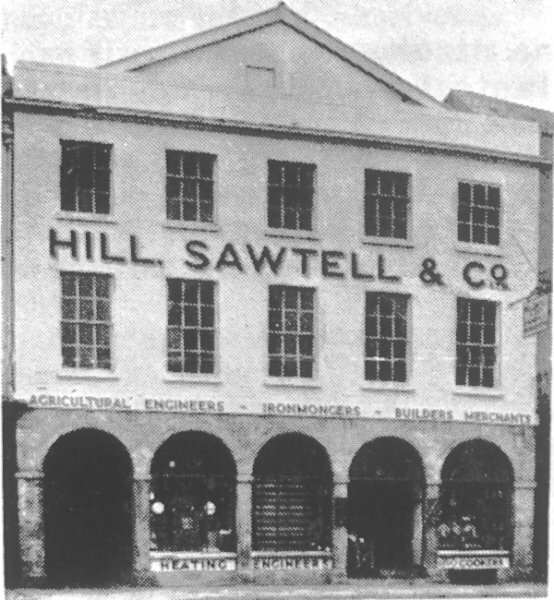 The South Street entrance to Hill & Sawtell's premises seen from alongside Penn Hill.